This is a strange ministry strategy- asking atheists to join us as we pray for the homeless and hurting. It’s hard to argue with the results. As we invite pre-Christians to administer grace with us, their worlds are turned upside down. When they receive this grace from those who they came to serve, it is a game changer. A study from the Chronicle of Philanthropy showed some interesting giving trends during the Great Recession. Those Americans who were earning more than $200,000 cut back their donations to charity by 4.5%, but those who earn less than $100,000 per year increased their giving by 4.5%. During tough times, those who made less gave more. This goes against common sense. It seems that those who make more would have the ability to give more and those making less would have to cut back on their giving. No one twisted the Macedonian’s arms to give. “They gave themselves first of all to the Lord, and then by the will of God also to us.” Their passion for God welled up into an urgency to give sacrificially. Paul notes this amazing occurrence as he writes to the Corinthians and challenges them to follow in the Macedonians footsteps. I think that from an American way of thinking, the Macedonians are being irresponsible. They should take care of their own financial issues first, and only then should they consider giving out of their disposable income. Once they have earned enough to provide for their family should they consider the privilege of helping the less fortunate. I guess God’s ways don’t look like ours. I find that the grace of giving is one of the most startling aspects of the faith life to pre-Christians. Why would we give out of our lack? Why would we be generous when we are poor? This kind of bizarre behavior reflects a core aspect of who God is. Jesus “became poor so that we could become rich.” Sacrificial love is giving away what we really need, not our leftovers. Sacrificial love is giving away what we really need, not our leftovers. When Jesus says, “So the last shall be first, and the first last”, he is talking about a Kingdom economy that is baffling to those of us accustomed to this world’s economy. He uses the poor to teach the rich about how to be generous. Makes you wonder who is really poor and who is really rich. There are many who can never have enough and constantly worry about losing what they do have. Then there are some who are so free with what they have that they don’t hesitate to give when they find someone in need. Are you in financial need right now? Do you have unpaid debt? Are you not making enough to cover your expenses? Are you experiencing a severe trial or extreme poverty? What if God asked you to participate in the grace of giving despite your circumstances? Isn’t he always? Maybe, like Megan, God will call you to do something radical, like a 6-month internship with The Relief Bus or serving in a foreign land overseas. Maybe he will just ask you to stop and give a few minutes of your time to someone who needs a friend. Who knows? Maybe God will even use them to be “foolishly” generous towards you. 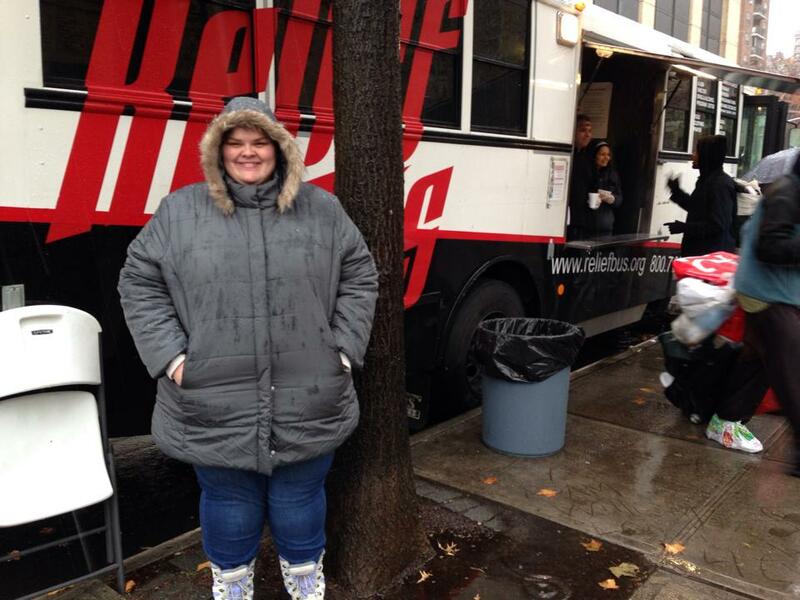 Megan and a volunteer developing friendship with a homeless woman in New York City.